How to make dal (pappu charu) without tamarind? Happy Father's Day to my Daddy, who is best in the Universe!!! I am Deepthi, a super mom and a Biology lecturer. Cooking wasn't really my passion ,before when I was alone at home in the winter, i can't do much outside I started cooking variety of dishes and my husband loved it. That is when I started cooking and trying different recipes and started enjoying it. Now that I am a supermom and also work, I hardly have time to cook, that is why I stated posting the healthy and easy recipes I make at home. CouponDunia.in ---A simple recipe to save money- Bloggoversary giveaway, ₹200 gift card to flipkart. 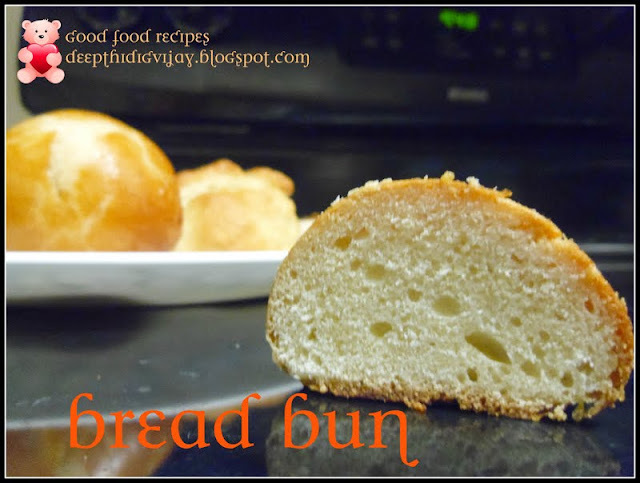 Today I am posting an interesting recipe to save some money. First thing everyone looks before buying any product is discount, yup! if you see me in any grocery store you would find me with a small bag filled with coupons. I love to save money, and always think twice before spending money on something, because I know the value of money. Here in USA coupon system is very popular, if you try to search some coupons online you can find tons of coupons to many popular stores all across USA. 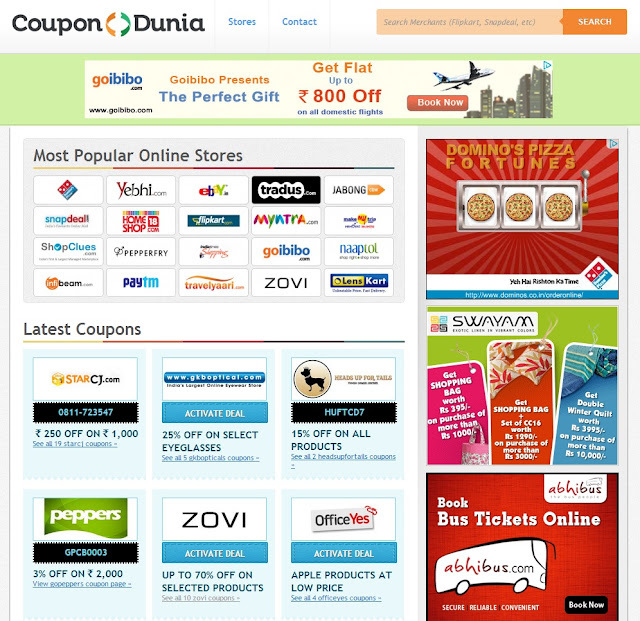 I was wondering why this system is not implemented in India, and to my wonder few days back I came across this site CouponDunia.in and I was so excited to see so many wonderful coupons and shared this with my family in India about this. My brother already used the Dominos coupon and told me it's working. So, I thought about sharing about this wonderful website with you all. Well friends you all know there is an event going in my blog " Home made remedy recipes" for this my first entry is kada. It is traditional North Indian remedy for cold and cough. You can make it and store it in refrigerator for one week. It is pretty tasty though. It gives you a sort of relief from sore throat, unblocks your nose, decongests your chest, and provides some relief from cough. Last week we had a small potluck party. I was very excited, like everyone does to impress them. The time was short and I did a lot of browsing to search for any Indian potluck recipe. But, I could not find many and the one that I found were taking pretty long time to cook. So, I stopped browsing and looked around my kitchen to find what all I have. If you are preparing for a potluck you have to make in a large portions (of course, our potluck gathering was very small, but what if it was bigger?) just look around your kitchen and find the one that is in larger quantity and you many not use it again (Such as instant cake flour), and try to prepare from that. If you are a person like me who prefer to make desserts only on special occasions then I bet you should have lots and lots of instant mixes like gulab jamun and cake mix in your store room. Just move their butts out and start making them. Here are the standard amount of calorie estimates for the Indian Food. This chart specifies number of claories you gain when you consume it!! here you can find the calorie information for milk and milk products, Fruits, vegetables, nuts, beverages, cerelas, dals, raits, chutneys and curry preparations. Chicken legs/ drum sticks are favorite food of my hubby, I used to make tandoori every time but yesterday I felt I should try something new. I just called my mom and asked the recipe for chicken drumsticks/legs, she told me this wonderful recipe. I gave a try & it came out really perfect, my hubby enjoyed a lot and told me, that he would be happy to have it every day!!!!! OMG I never expected my first attempt would be that great. Now, enough of the story let's have a look at the recipe. You know the best item to purchase for kitchen during thanks giving is Crock pot, I got it just for $10 and now it is $29. Though I did not have any idea how to use it, I just got it to experiment. When I told about this slow cooker to my mom, she immediately told me to make this biryani. She also said that in good olden days they used to prepare this way. The process of cooking slow makes the masala flavors in the curry to slowly diffuse in to the rice and gives a very unique and delicious flavor. Yummy !!! 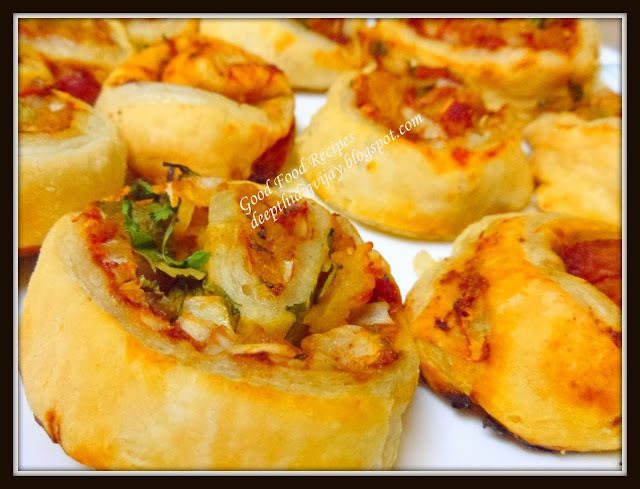 I love these yummy pin wheels, I wanna make it little healthy way so I avoided cheese..They came out really good with crispy and little with Indian taste. We finished it in no time!!!! Here are the ingredients for the yummy recipe Puff pastry Sheet-1 Tomato puree-1cup Boiled and mashed potato-1cup Cilantro chopped-1/2cup Onions chopped-1/2cup Green chili/pepper corns finely chopped-2ts Finely grated Ginger-1/2ts Finely grated Garlic-1/2ts Chat Masala/ Pudina Chutney Powder (available in Desi stores)-2ts Pepper powder salt to taste METHOD: Take the puff pastry sheets (Available in Frozen Section in all Grocery stores) out of the box and let it come down to room temperature.Mean while Chop all the vegetables.Add Pepper powder, very little salt to boiled potato and mash it. Keep it aside.Now Unroll the Pastry sheet, and sprinkle Chat masala/ Pudina(mint) Chutney powder with little salt. Apply tomato puree all over.